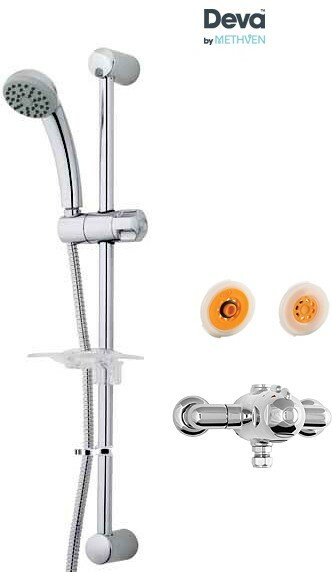 Deva Azure > Exposed Thermostatic Shower Valve, Single Mode Kit & Regulator. 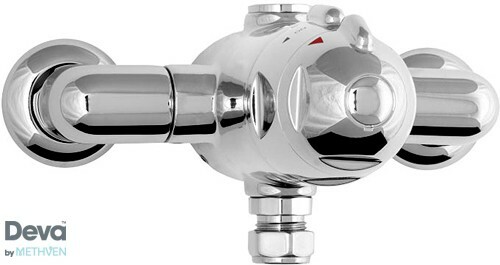 Exposed thermostatic concentric shower valve in chrome with single mode kit and water flow regulator. Water saving: Seal flow regulator to reduce water consumption. Kit includes exposed and concealed valve options. Double interlocked shower hose included (1.5m). Wall union included (for concealed installations). Suitable for low pressure systems. Pressure: 0.1 bar minimum water pressure required. 5 Year guarantee: Deva guarantee this Azure shower set for 5 years. The Deva Azure range is a showering experience where only your imagination limits where your journey ends. The Azure range of showers will complement any bathroom or shower room. Long guarantees: 12 years on chrome brassware, and 5 years on showers and gold brassware.